On 25/6 September 1940 a man took his own life in a hotel in Portbou, Catalonia. He was 48 years old. He was a writer, an intellectual, whose work, cut terribly short as it was, is still hugely influential. He was Jewish, and had crossed the border from France, having escaped Paris ahead of the German army. He’d just heard that all transit visas had been cancelled, and that he and his fellow-travellers would be forced to return to France. The UNHCR’s campaign for World Refugee Day focused on the ‘choice’ faced by refugees – to stay or to go, either one fraught with danger. Walter Benjamin – and many others – took a third option. He had contemplated suicide before, seeing Adolf Hitler’s rise to power. He’d recently been interned in France as a stateless person, and knew already that the Gestapo had instructions to arrest him. His choice is made bitter by our knowledge that his travelling companion, Arthur Koestler, took morphine tablets too, but survived and escaped, and that the embargo on visas was lifted a few weeks later. As Hannah Arendt says in her introduction to Illuminations, ‘only on that particular day was the catastrophe possible’ (p. 18). It’s also bitter because, if the scope of his influence on the humanities is so great on the basis of the work he published in his short lifetime, it could have been so much more had he lived. In the words of his friend Gershom Scholem, his ‘genius united the insight of the Metaphysician, the interpretative power of the Critic, and the erudition of the Scholar’. (Reflections, vii). Anyone interested in the city, in maps and labyrinths, in Baudelaire, Kafka or Proust, in text and translation, history and memory, will encounter Benjamin. Walter Benjamin stands, in this context, for our loss, the loss of those who didn’t escape, and particularly those – notable and anonymous – who chose this third way. 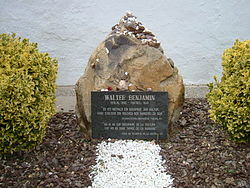 On the memorial to Benjamin in Portbou these words are inscribed: IT IS MORE ARDUOUS TO HONOUR THE MEMORY OF THE NAMELESS THAN THAT OF THE RENOWNED. HISTORICAL CONSTRUCTION IS DEVOTED TO THE MEMORY OF THE NAMELESS. This entry was posted on June 23, 2012, 3:01 pm and is filed under Refugees, Second World War. You can follow any responses to this entry through RSS 2.0. You can leave a response, or trackback from your own site.